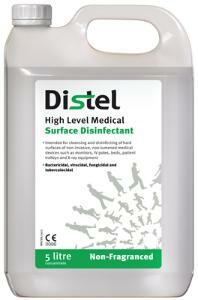 Distel High Level Medical Surface Disinfectant continues the trend of leading edge biosecurity technologies. At the heart of the Distel formula is a carrier system that enables the active molecules in the product to be carried through cell walls of microorganisms. This allows both rapid and effective results, and makes it safer to use than conventional products. Distel is suitable for disinfecting medical equipment surfaces to help prevent cross-contamination of infectious agents (e.g. MRSA, Norovirus). Intended for use on hard surfaces of non invasive, non lumened medical devices such as monitors, IV poles, beds, patient trolleys, ultrasound and X-ray equipment. 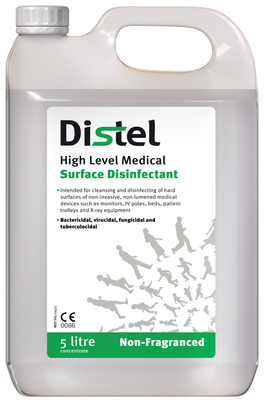 Distel High Level Medical Surface Disinfectant is recommended for use diluted at 1:100 for high level disinfection, and at 1:10 in the presences of blood and bio-hazard spillage.